Rap is now in 5th grade and I swear his science projects are getting harder each year! Nevertheless, however toxic it may seem, I also enjoy helping my son with his projects. 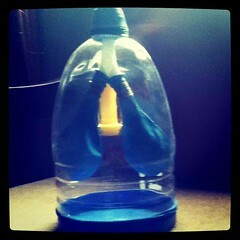 His latest project for this trimester is this lung model made of a plastic bottle, plastic straws and balloons. You don't need to be a specialist in Radiologic Technologist Jobs to be able to do this. The only major challenge that I had was creating a Y-shaped tube out of the large plastic straws connected with plastic adhesive tape. Basically, everything will just be assembled to make it look like so. Everytime the rubber base is pulled, the "lungs" expand and deflate.